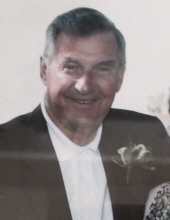 Robert John Holzworth, age 89, a longtime resident of Stonebridge in Aurora, IL, passed away peacefully on February 6, 2019 at his home, surrounded by the love of his family. He was born on February 7, 1929 in Jackson, MI. Robert is survived by his beloved wife, Ione "Midge" Holzworth; his loving children, Cindy (Dave) Grady, Mike (Barb) Holzworth, Karen (Todd) Morris, and Pam (Mark) Genovese; his cherished grandchildren, Jason (Jess) Grady, Ashely (Robert) Saba, Stephanie (Adam) Clay, Matt (Liz) Holzworth, Cris Park, Kelsey Grady, Trevor Grady, Nico Genovese, and Shelby Genovese; his dear sisters, Marion Eisele, Liz George, Dorothy Horn, Agnes Norton, and Jane Dillon. He was preceded in death by his parents, John and Marie Holzworth; his grandson, Nick Nicholas Camp; as well as his sisters, Lynn Horn and Phyllis Miller. Robert proudly served in the U.S. Army and was honorably discharged in 1952. He graduated from Michigan State University. He was employed at General Motors from 1956 until 1993, and retired as the General Sales Manager for the Oldsmobile Division. A devout Catholic, Robert had been a member of Our Lady of Mercy Catholic Church, Aurora, for the last 25 years. He gave selflessly of his time and talents at his church and through the St. Vincent De Paul Society. In his free time, he loved to golf, plant flowers in the spring, cook for his family, and root for his Detroit Lions and Michigan State Spartans. In lieu of flowers, for those who would like to leave a lasting tribute to the life of Robert John Holzworth, memorials to the "St. Vincent De Paul Society" in care of Our Lady of Mercy Church, 701 S. Eola Rd., Aurora, IL, 60504 would be greatly appreciated. A memorial visitation will be held on Friday, February 15, 5:00 until 8:00 PM at the Friedrich-Jones Funeral Home & Cremation Services, 44 S. Mill St., Naperville. All are invited to gather for the Mass of Christian Burial on Saturday, February 16, 10:30 AM at Our Lady of Mercy Catholic Church, 701 S. Eola Rd., Aurora. A private family inurnment will be at Assumption Cemetery, Wheaton. To send flowers or a remembrance gift to the family of Robert John Holzworth, please visit our Tribute Store. "Email Address" would like to share the life celebration of Robert John Holzworth. Click on the "link" to go to share a favorite memory or leave a condolence message for the family.